For anyone looking for another means of streaming music to their Android device without having to use an app with a UI that would make a Nexus cry, 8tracks is worth a look. The interface keeps things simple, which these days means it's pretty white. 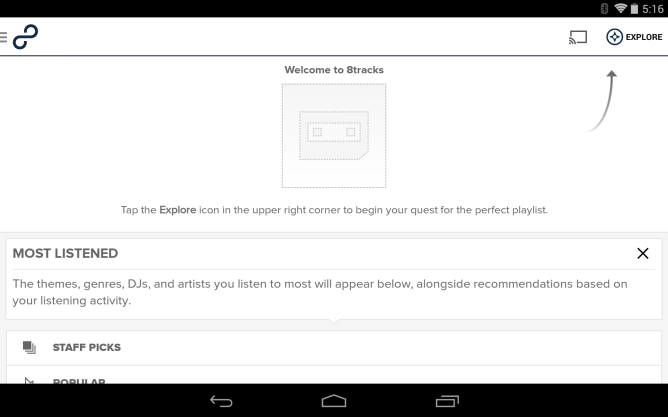 Existing users will be pleased to know that following the latest update, 8tracks now comes with Chromecast support. As long as your connected TV or monitor is on, you will see the familiar icon in the action bar at launch. That's the only new feature contained within this update, as the rest of the tweaks have to deal with bug fixes. But when the top item is Chromecast support, the change log doesn't need to contain much else. We added Chromecast support, so now you can beam 8tracks playlists to your TV Starship Enterprise-style. Those bugs that were giving you trouble? We told ‘em to scram! You can once again sort by trending, newest, and popular. We’re giving the power back to the people. The new permission is so you can send us your 8tracks logs.